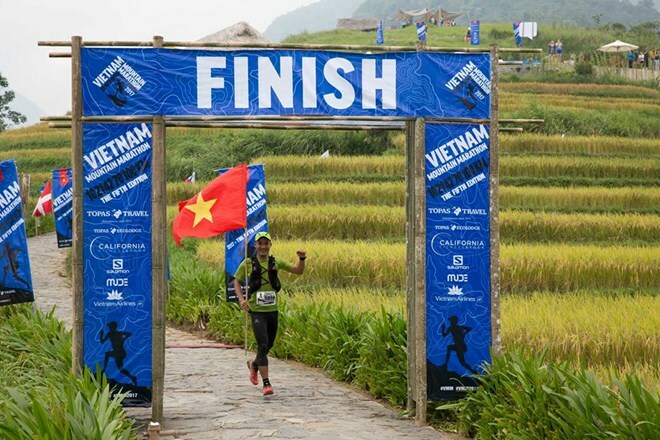 Hanoi (VNS/VNA) - Tran Duy Quang, a Vietnamese national, won the 100km race at the fifth edition of the Vietnam Mountain Marathon (VMM). The marathon, which concluded in Sa Pa on September 24, is one of the biggest ultra-running events in Asia and a landmark event on the Southeast Asia calendar. Quang beat rivals from all over the world, by running through the long, dark night over the highest peaks of Vietnam, to take the lead with a time of 13:17.35. Manolita Divina from the Philippines finished second, and the third place went to Matthew Johnston of the United States. On the women’s side, Kim Matthews of Australia triumphed with a time of 17:52.23, followed by Hoa Banh of Australia and Nguyen Thi Duong of Vietnam. “The weather was great for the race. I really enjoyed running through the terraced fields and Mong villages. Running in Sa Pa is always a great pleasure. My result has improved as compared to last year, and I reached my goal of 100km in less than 15 hours. This is also the first VMM edition I ran for, to support the NGO, Newborns Vietnam, with the hope that more people support their amazing work,” said Quang. In the men’s 70km race, Graham Knight of Great Britain took the lead with a time of 9:03.22. Nguyen Quang of Vietnam and Julien Petit of France were the runners-up. On the women’s side, Nadia Koucha of France ranked first with a time of 10:32.33. Christine Loh Woon Chze of Malaysia and Catherine Wilson of Great Britain finished second and third, respectively. “The event’s 70km category was really the hardest race I’ve ever run but I’m so glad I took part in it. Watching the sunrise over Fansipan was such an incredible experience, and the scenery is spectacular. I chose to run for Newborns Vietnam to raise awareness about the amazing work they are doing to improve medical care for premature babies in Vietnam. I’d encourage everyone to find out more about them and support their work,” said Knight. In the 42km race, Boyoung Jang of the Republic of Korea triumphed in the women’s category, after clocking a time of 4:15.02, while Jisub Kim from the same country took the lead with a time of 2:10.26 in the men’s category. Ban Thi May of Vietnam defeated some 350 rivals to win the women’s 10km race, with a time of 1:04:57, followed by her teammates Hoang Thi Tham and Moc Thuy Linh. In the men’s event, Junwei Ng of Singapore beat some 300 participants, with a time of 52 minutes and 35 seconds. Vietnamese Le Van Tuan Anh and Giang A Sung were the runners-up. This year, the tournament saw the participation of 2,500 runners from 50 nations. Well-known runners also competed in the race, including British Ambassador to Vietnam Giles Lever, TV host Thuy Dung, actress Vu Thi Hoang My and Miss Universe Vietnam 2017 judge Nguyen Huong Giang. “We look forward to our next trail race, the Vietnam Jungle Marathon in Pu Luong Nature Reserve in Thanh Hoa province, next year,” Lloyd said.